An elderly woman Nozo Zintoyinto who makes a good living predicting the results of soccer matches has given her thoughts on the outcome of the 2017 AFCON final in Gabon. In South Africa, there’s great anticipation among soccer fans ahead of the semifinals later this week of the 2017 African Nations Cup and ghanaweb.com say some South African sangomas, or traditional healers, who claim links to ancient spirits, are doing good business predicting likely winners. Eighty-five-year-old Zintoyinto from the Xhosa ethnic group is one such sangoma. She has been doing it for more than 60 years. 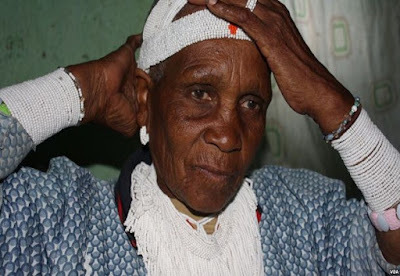 Zintoyinto explains that a deceased ancestor appeared to her in a dream when she was a teenager and “called” on her to be a sangoma. Then a senior traditional healer trained her to interpret “signs from the spirits,” to heal people and also to forecast the future. Zintoyinto’s services are not free and, lately, she says, business is good. Zintoyinto shakes a handful of seashells and throws them on an orange blanket on the floor. She says her ancestors help her interpret events based on how the shells land. “You must remember, the shells are always correct. They are the connection with my ancestral spirits. But sometimes I must admit I don’t interpret the shells 100 percent right. Because when I’m busy with the shells, the ancestors are making a lot of noise in my mind,” Zintoyinto says. The first AFCON semi-final on Wednesday features outsiders: Burkina Faso against the competition’s most successful team, Egypt. The Pharaohs are bidding for their eighth tournament win. “The spirits are showing me players dressed in red. They are celebrating. They have light skins. They are not black Africans,” Zintoyinto says. Her words point to a victory for Egypt. In Thursday’s semi-final, one of the title favorites, Ghana’s Black Stars, will face off against Cameroon’s Indomitable Lions. Both are four-time competition winners, but soccer analysts have labeled Cameroon the underdogs. “The ancestors are shouting a lot. They are disagreeing about this match. But most are telling me Cameroon will win,” Zintoyinto says. So, according to the sangoma, it’ll be a Cameroon versus Egypt in the final match but which team will prevail?